More news now in from Camper & Nicholsons as Craig Erikson signs the 29.6m motor yacht HP4 for sale. 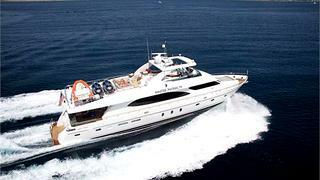 Built by Hargrave in 2006, HP4 was refitted in 2012 and her decks feature ample sunpads and an outdoor cinema. Accommodation is for 12 guests in five large staterooms including a full beam master suite and her Caterpillar engines are warrantied until 2016. HP4 is lying in Florida.